Soooo…I asked Santa to bring me GATU and Vicarious for Black Friday. Apparently that’s “not in his job description”. Okay there, Mr. Red Suit. Although the Clause wasn’t any help to me, the Black Friday fairy has an awesome Paula Stokes offer for you! Liars, Inc. is only $1.99! WHAT?! Yeah, I’m serious. Read on for all the thrilling details. Paula: I was super-thrilled to see that HarperTeen put the Liars, Inc. ebook back on sale for Black Friday, this time across multiple digital platforms. You can score an e-copy all week for the low price of $1.99 from Amazon, Amazon Canada, B&N and iTunes! I’m a girl who will buy almost anything if it feels like a mega-deal, but I realize that some people are a little more discriminating when they buy books. 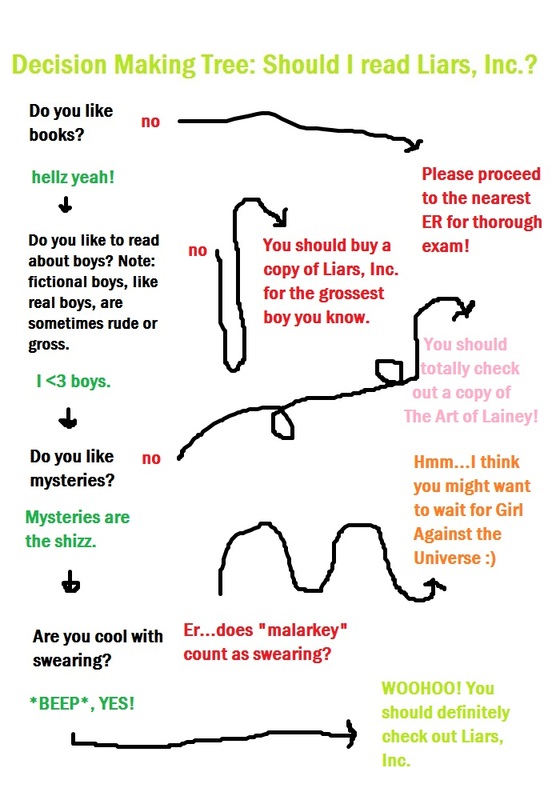 Therefore, I’ve designed a handy decision-making tree to help you determine if Liars, Inc. is right for you! JUST FOR FUN: Check out the top ten things I would bring with me if I had to go on the run from the feds. Includes essentials like Chapstick, chocolate, and flash bangs. If you leave a comment, tell me the top 3 things you’d pack if you went on the lam. Have you bought Liars, Inc. yet? No?? What are you waiting for?! I know the awesome chart and other fun stuff won you over so just scroll on up and grab one. Also, prepare yourself for a wild ride.